Apart from being a great CSR campaign, the Mahindra Rise promo site is by far the most well put together promo site that I have come across in some time now! It is a complete campaign. Most of us have loved the TVC and just the other day I saw a print full pager, which prompted me to check out the site. 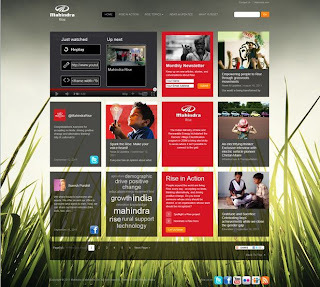 The site brings together what Mahindra Rise stands for and their initiatives in a simple yet attractive layout which includes a social mash-up of Rise videos on Youtube and their Twitter & Facebook presence. The site boasts of rich content with interesting ‘Rise in Action’ stories which include links to important projects, articles around grassroots movements that users can learn more about and contribute to, interviews of people who made a difference, Rise News and Did You Know snippets. Users can also subscribe to the Rise Monthly newsletter on the site for the latest updates. There are also various avenues for users to contribute & engage. People can share ‘Rise in Action’ Stories they have come across, profiling people and projects that are contributing towards a better community future. The biggest User Engagement piece is the ‘Spark the Rise’ promo. Anyone who has an entrepreneurial idea or solution that has the potential to make a positive change can share it and stand a chance to possibly win grants and see it come alive. Users can also vote for their favorite ideas on the site. Information search on the site has also been looked into (how many times have you seen that in promo sites?). You can search stories from Rise Topics or popular story tags. 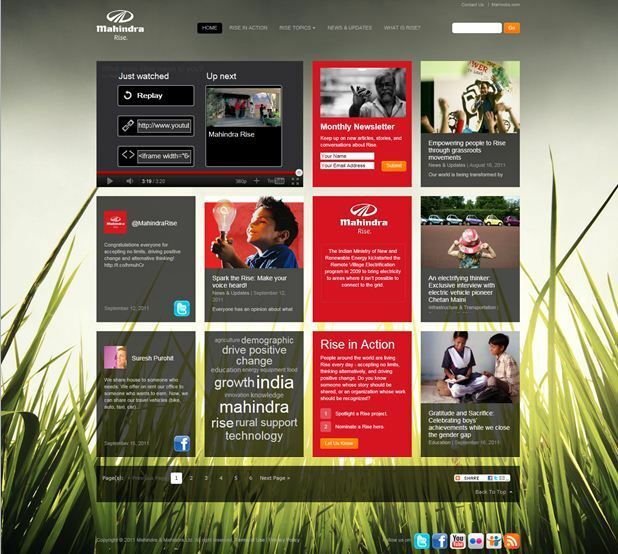 The Mahindra Rise site is a good example of how to get it right on the web with great content + attention to detail + well rounded approach (w.r.t. promotion, social media, information search).